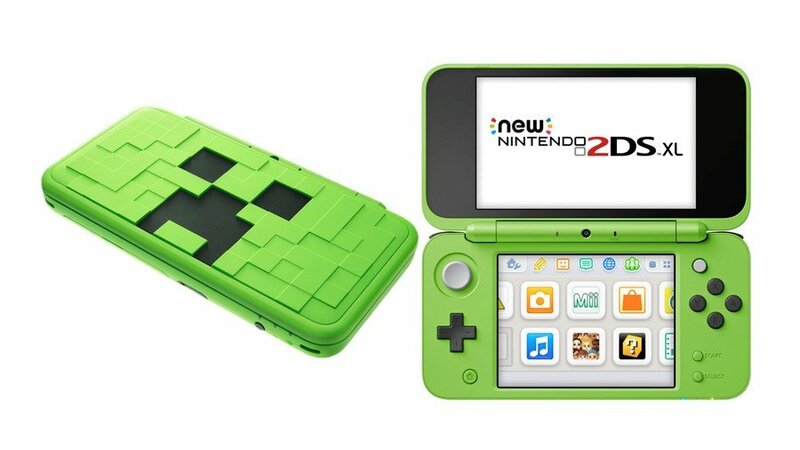 Nintendo has officially revealed the Minecraft New Nintendo 2DS XL 'Creeper Edition' for Europe. Back in July, this luminous green beauty was confirmed for Japanese buyers alongside new Animal Crossing and Mario Kart bundles, but it was unclear whether or not the system would make it to western shores. Then, late last month, we spotted the console tucked away inside a PDF file sent by Nintendo RU around the time of Gamescom. It turns out that the PDF file wasn't lying after all, and the system is indeed about to arrive in Europe. On 19/10, look out for the #Minecraft New Nintendo #2DS XL – Creeper Edition, distinctively decked out with a Creeper design and pre-loaded with Minecraft: New Nintendo #3DS Edition! While the Creeper design is sure to be the major selling point of this one, the console also comes with a copy of Minecraft: New Nintendo 3DS Edition pre-loaded. If you're a Minecraft fan still looking for a new 2DS system, or know someone who is, you can't really get much better than this. The console will be available in stores from 19th October. Will you be treating yourself to one of these? Let us know down below. Before i buy New 2DS LL, how is the speaker's sound quality ? Is it same louder as New 3DS LL ? The shell's pattern is neat, but I dislike that shade of green. I'd much rather buy the Hylian shield one. A Fortnite Switch bundle and a Minecraft New 2DS XL, both are sure to be big sellers for the Christmas season. Also, YAY MINECRAFT ON 3DS FINALLY?!! So happy. I'm far more inclined to take my 2ds out in public than my switch, so Minecraft on the go with buttons, hell yes. 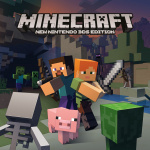 Minecraft has been available on New 3DS (not Old 3DS) for over a year now. It's a pretty limited version of the game with no multiplayer support and a lot of trade-offs. Edit: Although looking it up, it's only just become available in Europe, and has been updated with more content. So, they release Minecraft 3DS game, but slap it on a 2DS? They truely have given up on the 3D aspect. Ain’t giving up my 3D. It’s really weird that Nintendo is releasing hardware themed after a Microsoft owned IP. Cool, but weird. I think the real news here is that Europe finally has Minecraft on New 3DS, after having to wait for whatever reason. I still quite like the way this one looks but don't care for Minecraft. I feel weird. That is the ugliest handheld device I've ever seen. @Lars_dk "Weird they dont remove that Miiverse icon...mayby there`s hope"
I'm still scratching my head over why they haven't removed it in a firmware update. Miiverse was one of the coolest things Nintendo ever did, and it guts me every time I see that icon knowing that they killed something so awesome. still waiting for the Hylian shield edition. This system looks really cool even though I'm not a Minecraft fan. @Flokii I'm surprised it actually took a whole year for a European release too. Not really into Minecraft, but it's got my favorite color. I kinda want it. @RupeeClock yeah the update includes multiplayer. Only 2 player though. @eSocrates For a pair of kids with New 2DS systems on Christmas that's probably incredible enough. @RupeeClock oh hey! That news article says they added the end, shuckers, elytra, etc! It’s basically a full featured version of Minecraft now, all it is missing now is the aquatic updates. It's really neat looking. But unless they add a GBA/Game Boy slot, I am not buying yet another 3DS. For those saying they gave up on the 3d aspect, not so, Luigi's Mansion (remake) will be stereoscopic 3d. Also, The Hylian Shield has a slightly stronger upper lid (decreasing likeliness of upper screen breakage) due to the Sheild border as I suspect the creeper version will with the [creepers] added layers. The supposed speakers being muffled due to location in the corners, I personally never found that to be a problem, in fact, the sound reflects off my palms and sounds better IMO. @Bunkerneath At this point, they're marketing the 2DS/3DS line as a budget alternative to the Switch. The 2DS likely sells better, thanks to the cheaper price. Not to mention, a lot of people, especially kids, couldn't use the 3D without their eyes/head hurting. Minecraft on Switch and Vita -or even mobile with a controller- is just better. This is for collectors. If you have extra cash to burn its ok i guess, otherwise it aint worth it.